Welcome to Everflowing Waters, where tranquility comes standard and relaxation is a given! Our season is April 15 to October 31. We have 52 campsites that can accommodate everything from bicyclists camping in a small tent to full size RVs towing vehicles or trailers. We proudly support our military families. If you are an active military member or a proud veteran, ask about our military discount. Includes water & electric. Rate is for 2 adults. Each additional adult is $5 per night. Children under 18 included free. For up to 2 adults. Each additional adult in the same tent is $10 per adult. Trailer Storage: Fee is $5 per day to store boat or utility trailers on site. Yearly, monthly & weekly rates are available. Contact us for details. We accept check, cash and credit cards. 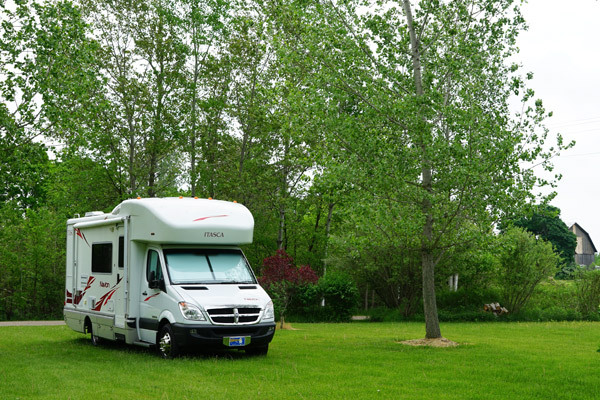 Are you a Roverpass RV Club member? If so, you’ll enjoy a discount on today's reservation! We accommodate tents, trailers, fifth wheels, RV's, pop-up campers, vans, motorhomes, bicycle travelers, motorcyclists, and groups. Do you have a special need or request? Let us know, and we will do our best to accommodate you!